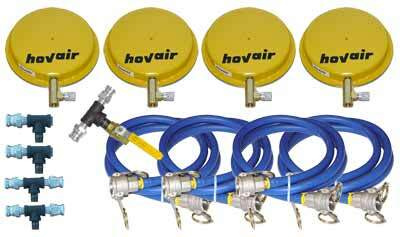 Using Hovair's air bearing powered machine handling and load moving equipment systems you can now move loads of any shape, size or weight using just a little of the regular compressed air in your shop. These systems are so easy to use. Anyone can use them: guys, gals, even the boss.We have a great range of starter kits available complete with all hoses and necessary fittings for load moving equipment and machine handling and loads of all shapes and sizes.Or we can supply kits that fit directly and permanently to your load. To handle that 10-ton load or machine you simply plug in your airline and take it away. It really is that simple.You can handle machines and other loads of up to 100 tons and more with virtually no effort at all using Hovair's load moving equipmentCheck out our main web site and look for the demo videos which will show you just how easy these systems are to use. These great systems are in use all across the world and are making life so much easier for their owners. Ask Boeing, Hewlett Packard, Pilkington, Lockheed Martin - all companies that use them daily.